Over the years, I have seen patients with sprains or strains in almost every location on the body. I've also heard almost every scenario in which these injuries occur. From sprained back or neck muscles, sprained ankles, skiing injuries, face planting into the sand during surfing, to trampoline accidents, there's never a dull moment. If you've had a sprain or strain, you know that being educated on the nature of the injury is key. First, it's important to understand the difference between a "strain" and a "sprain". A strain occurs in muscles and tendons- the structures which contract and allow movement. Muscles and tendons receive constant blood supply. Since swelling is basically increased blood flow to an injured area, and the muscles receive a lot of blood, swelling and pain occur quickly in strained muscles. Besides sudden traumatic injuries, muscles can also be strained slowly from overuse in sports, holding a position or posture for too long, or from prolonged fine motor activity such as when using a computer mouse or typing. A sprain occurs in ligaments - the shorter structures (pictured above) which hold one bone to another bone. You don't have any control over ligaments. If you remove all your muscles, you'll see that underneath it all, they're basically the rubber bands that hold your bones together. Ligaments receive a very slow blood supply, so even when they're injured, swelling can take days and in rare cases even weeks to occur. This accounts for people who sprain their neck in a whiplash car accident and don't feel much pain, but then a few days later wake up unable to move their neck or back. The swelling takes longer and unfortunately, so does the healing process. While strained muscles take anywhere from 1-6 weeks to heal, seriously sprained ligaments can take up to 3 or more months to totally heal. Immediately after an injury, the body will go through "Active Swelling" reaction which lasts anywhere from 12 hours to 3 days. The swelling can continue if some activity is re-injuring it; such as a person with wrist tendonitis who keeps typing even though it hurts. In that case, the swelling will be perpetual and never go away. The goals during swelling are to use ice and to allow rest and support of the injured area. For about 4 days following the injury, "Congestion" occurs. Fluid gets trapped in the tissues and causes restricted motion and pain. This is when we want to help people with range of motion through stretching and adjustments. Once the joints are moving with more ease, swelling and pain can drastically decrease. From the week after the initial injury to about 6 weeks (give or take depending on the severity) is the "Repair Stage". 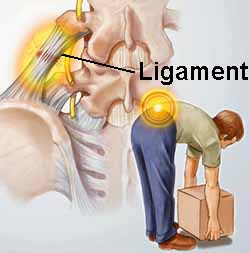 During this period, ligament and muscle fibers are quickly and randomly laid down. These new fibers do not lie in the direction of the "grain" of the old healthy fibers. Chiropractic adjustments and specific stretching help break up the useless fibers and promote growth of fibers going the right direction. Even after the pain goes away, these fibers will remain if untreated, leaving you weaker and prone to re-injury if not treated. For the next 4 months up to a year, "Remodeling" occurs in the connective tissue. Remodeling of tissues for better strength and flexibility occurs based on the demands you put on the area. Rehabilitation exercises are crucial if you want to avoid re-injuring the same area again in the future. These exercises are tailored to the individuals particular injury and needs. A chiropractor is qualified to help guide you through the process of carefully selecting exercises that will produce the best strength and prevent re-injury.